Spotty teenagers may have the last laugh over their peers with perfect skin after research found that those who suffer from acne are likely to live longer. Their cells have a built-in protection against ageing which is likely to make them look better in later life, a study has found. By the time she reaches middle age, the spotty girl who could never find a boyfriend could be attracting envious glances from her grey and wrinkly peers. Experts had already noted that signs of ageing such as wrinkles and thinning skin often appear much later in people who have experienced acne. Now, scientists believe they may have discovered why. A study of white blood cells taken from individuals affected by spots showed they had longer protective caps on the ends of their chromosomes. Called telomeres, the caps can be compared with the plastic tips that stop shoe laces becoming frayed. They help prevent the chromosomes, packages of DNA, deteriorating and fusing with their neighbours during cell division. Telomeres shrink over time and are closely linked to biological ageing – people with long telomeres age more slowly than people with short ones. The new research shows that acne sufferers tend to have significantly longer telomeres and may therefore be blessed with the gift of long-lasting youthfulness. Lead researcher Dr Simone Ribero, from King’s College London, said: “For many years dermatologists have identified that the skin of acne sufferers appears to age more slowly than in those who have not experienced any acne in their lifetime. “Whilst this has been observed in clinical settings, the cause of this was previously unclear. 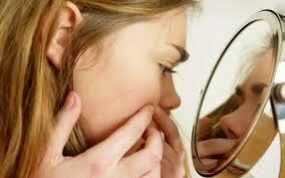 “Our findings suggest that the cause could be linked to the length of telomeres which appears to be different in acne sufferers and means their cells may be protected against ageing. The study, published in the Journal of Investigative Dermatology, looked at 1,205 female twins, a quarter of whom reported having had acne. One of the genes involved in telomere length was also found to be associated with acne, suggesting that being spotty did not slow ageing itself but flagged up what was happening in a person’s cells. Analysis of skin samples from the twins highlighted a gene pathway called p53, which regulates apoptosis, or “programmed cell death” – a kind of cell suicide. When telomeres become too short, it can trigger a series of events that lead to apoptosis. The p53 pathway was shown to be less active in the skin of acne sufferers, although this is still under investigation. Co-author Dr Veronique Bataille, also from King’s College London, said: “Longer telomeres are likely to be one factor explaining the protection against premature skin ageing in individuals who previously suffered from acne.